Please see below important information from the Harbour Master / PSO Dampier of Pilbara Ports Authority in regards to Port of Dampier, Tropical Low 21U – Update 1. 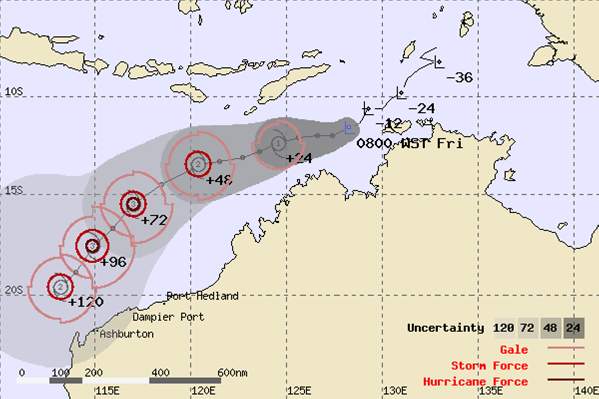 As per latest BOM forecast a tropical low(21U) is currently located west northwest of Darwin. This weather system is likely to move in a West-South-westerly(WSW) direction and expected to intensify to tropical cyclone strength later tonight or early Saturday morning. ALERT LEVEL: The Port of Dampier is currently at Cyclone stage 1 - Monitor. This stage involves monitoring the weather system and assessing its likely path and potential impact on the Port of Dampier. The response plan accounts for time required for vessel's to clear the port and the approaching tropical system safely. The weather forecasts will continue to be monitored with further advice to be issued within the next 24 hours or earlier if there is a substantial change/escalation to the situation. 1 Mof Road Dampier, WA, Australia.